Childhood home of the late Michael Jackson in Gary, Indiana. Quickly I ran out to play, under the puffy white clouds that hung neatly in the clear sky—a few miles from Lake Michigan waves. Keeping watch was Mama, hawking me as I anxiously waited to get dirty with Joe and Katie Jackson’s kids. My squeals of delight punctuated the summer air as I played for hours with the large family that lived across the street. Their petite home rested on the street named in honor of U.S. President Andrew Jackson in Gary, Indiana. It was only a short rock glide from my great-Aunt Esther’s house. Tall and shapely, she was my favorite. She had cocoa skin and an empowering voice that vacillated between the conversation of royalty and the ferociousness of a bobcat during heated debates. If there were even a hint that she was losing an argument, she would simply end it with “it’s a long story.” Her rich oral fables brought comfort to neighbors and guests, who were welcome to sigh, laugh and lie about the activities of the day. Indelibly etched in my heart are Esther’s narratives with feelings that reflect the aspirations and hopes shared by my working-class family, the Jacksons, and thousands of others in Gary. The house she shared with her husband, Turner, was where I grew, learned about life and witnessed the tumultuous rise of the world’s most famous musical family, the Jackson Five-my childhood playmates. I was very young when I played with Michael—so all that remains are flashes of memory, largely obscured by the mist of time. We were only old as recharged car batteries-about 2 or 3 years old. Years before Michael, the boy who would be King, whose talent engulfed the world and forever altering the course of musical history----his grandfather, Samuel Jackson was a morning fixture sipping black coffee in Aunt Esther’s kitchen. When the Jackson brothers were still performing on the “chitlin’ circuit,” they often played at Sonny’s Den, a neighborhood juke joint on 12th and Grant Street. I lived about a block away, but I was still too young even to walk pass the spot. The emotions from those long-ago days at 2300 Jackson Street have unearthed stories of my family’s relationship with the Jackson family. The eldest Jackson, Rebbie, and my older cousin, Faye often practiced jump-rope routines on the warm neighborhood sidewalk. One evening, Jackie Jackson or “Jackie Boy” as he was called back then, was caught drinking gin by his Mama, Katie. Jeffery, Esther’s son, was usually with Jackie Boy during his episodes of backyard mischief. My Uncle Ike’s love interest was Michael’s aunt, Lula Jackson. Their relationship produced a baby boy, Wendell, who is my cousin—and “The King of Pop’s first cousin. Many years have gone by since those times at Aunt Esther’s. 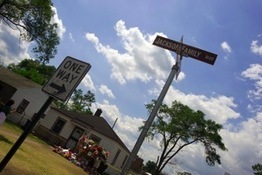 But, I will always treasure the moments on Jackson Street and our family’s enduring love. Most of all, I hold close the memories of wrestling in the grass with the Jackson kids.